Since I work at the OCCC I have had a great view watching this coaster go up. 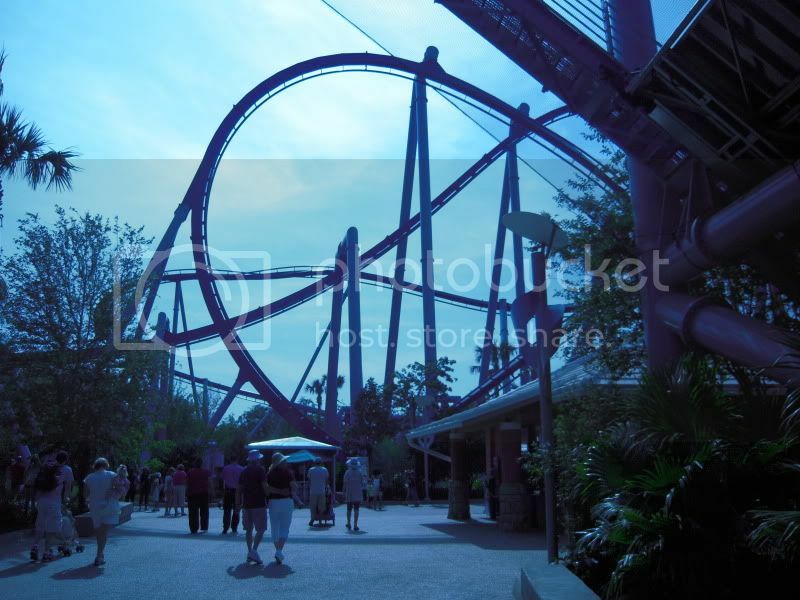 In fact, the lift hill of Manta looks straight at my office! 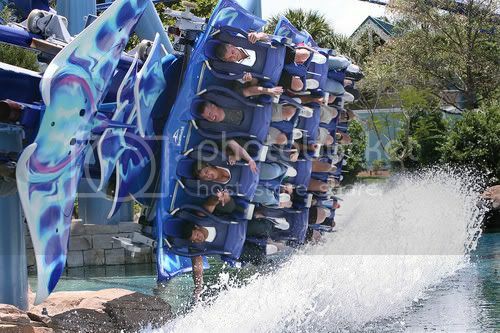 Both days that I’ve gone to Sea World to ride Manta I managed to forget my camera. Luckily my mom took a couple photos! 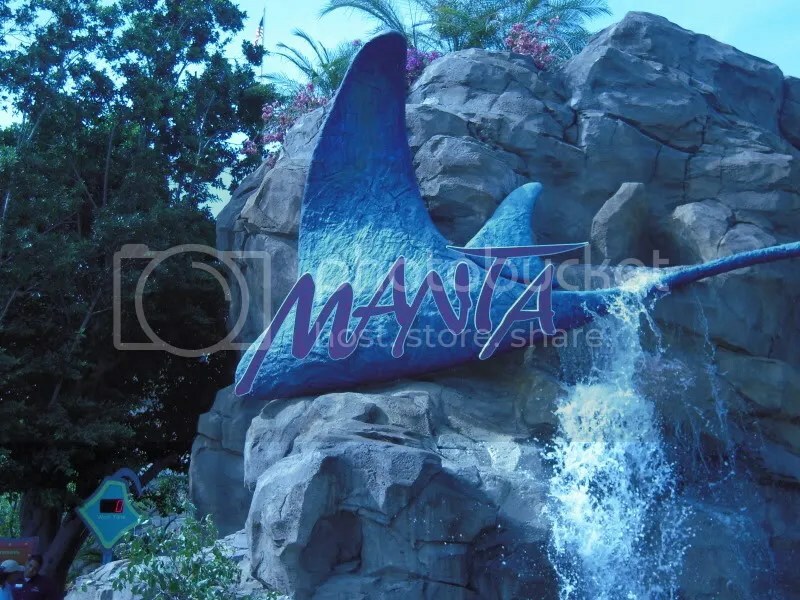 Manta is currently in “soft opening” which means it opens for part of the day each day while they work out all the bugs and get their employees up to speed. This means frequent delays, but luckily I never managed to get stuck on the coaster! I’ve now ridden it six times and have ridden all over the train. From the front row to the back row and if there is one way to describe this ride, it is intense! The pretzel roll is my new favorite coaster element. It is like nothing I’ve ever felt before. It was completely unexpected, because the ride doesn’t appear that fast. Since I’ve ridden all over the train, I will say that the last row feels the most intense. I’m not sure if it actually has more G’s, but it sure feels like it. The front row has the best views, but since you are looking down for the most part, every row has a decent view. I also love how smooth the coaster it is. It feels as though you are gliding through the course. I’m sure that this was intentional since you are riding with a pack of Manta Rays! As you can tell from the pictures, you ride over the walk ways and because you go upside down and on your head, you need to have empty pockets! No problem, because Sea World has installed lockers near the entrance. Unfortunately they took this opportunity to jack up the prices. At Kraken and Journey to Atlantis the lockers are $.50 for a one time use. Manta’s are $.75. They are the same lockers! It should be noted that you will lose what is in your pockets. Keys, cell phones, spare change! The ride “officially” opens this Memorial Day but has been running every day for at least the afternoons recently. 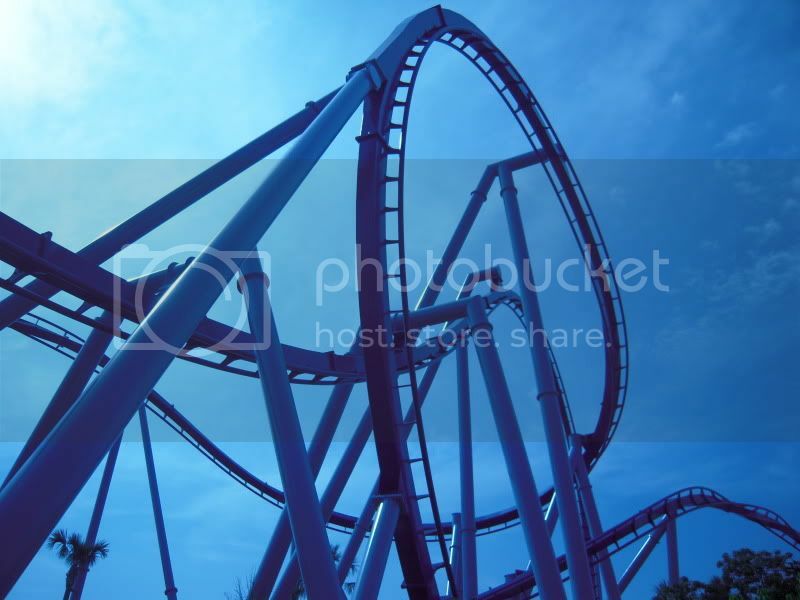 If you are near by and love thrill rides, go ride it! I’ll leave you with an amazing shot of the “wing dip.” This photo was not taken by me nor my mom, so I don’t take any credit. I’m actually not sure who to give credit for it, but it is a wonderful picture, so I’m going to use it! I didn’t take any photos of it, but the dual loading station is pretty cool. You get in the ride sitting down and then rotate to a flying position! You can read about/see it in action at The Disney Blog in the post Manta Madness! IT looks cool but I can guarentee I will never go on it! Looks very cool. I think I am a bit scared to go on it…seeing that you are “laying” down on the ride but who knows. Good news is that I have plenty of time before I need to worry about considering going on it! omfg. i’m nausiated just lookin at that thing. That looks like mega fun!!! We are coming back to FL in December…….we may have to make a trip to Sea World! !